If it seems like the number of record-breaking and other noteworthy diamonds discovered has been increasing in recent years, it’s because they are. 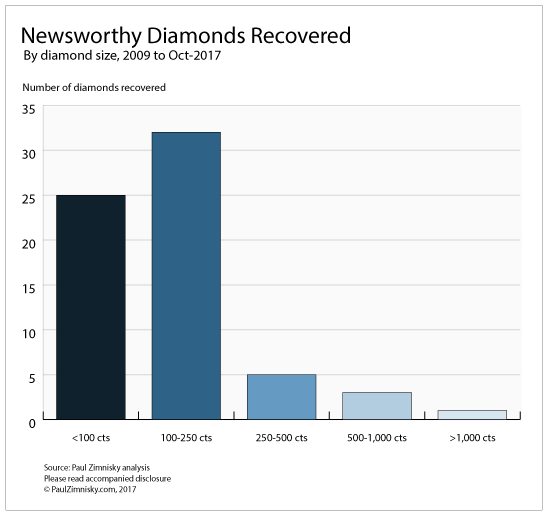 Over the last nine years 66 press-released-diamonds were recovered, and 61 of those have been found within the last five years. These diamonds were considered special enough that the company that discovered them subsequently issued a press release to announce the occasion. For publicly traded companies, securities laws generally require notifying the public when a “material” event occurs. In this case “material” typically means information that will have an impact on the company's stock price, or the announcement will likely change the perceived value of the company’s stock. Given the unusual asymmetric valuation of diamonds compared to other commodities, for a diamond miner, a material event could include the discovery of a single very-valuable diamond. The greater the value of the diamond recovered and the smaller the size of the company, the more material a diamond discovery is to a particular company. A good example was when Lucara recovered the 1,111-carat “Lesedi La Rona” in November 2015. At the time of the discovery the market cap of Lucara was just over $500M and the perceived value of the diamond was upwards of $75M, or 15% of the value of the whole company. When Lucapa Diamond (ASX: LOM) discovered a pure 404-carat stone in February 2016 the situation was similar. The market cap of the company was under $100M but the diamond was worth over $15M. Letšeng mine in Lesotho. Source: Gem Diamonds. Over just the last 2-years multiple historic gems have been found. In addition to the “Lesedi,” Lucara also found an 813-carat stone the same weekend, which later sold for $63M, making it the most expensive rough diamond ever sold (The Lesedi sold for $53M). 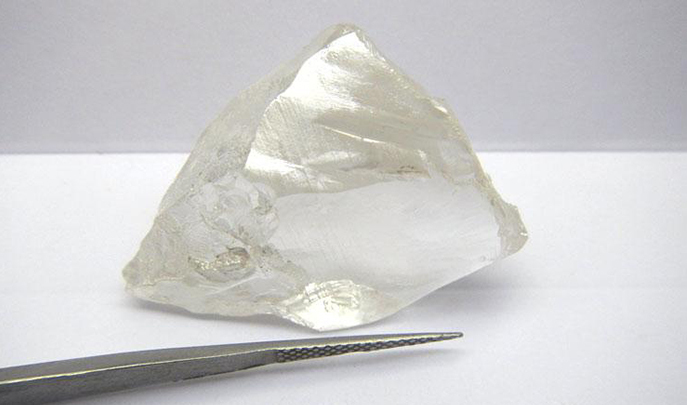 The aforementioned 404-carat diamond that Lucapa recovered was the largest ever found in Angola. In December 2015, Rio Tinto recovered a 187-carat diamond at its Diavik mine in Canada, the largest gem-diamond ever found in North America. And just last month ALROSA produced a 28-carat fancy-pink diamond (see image below), the largest of its kind ever found in Russia. Lucara’s Karowe mine in Botswana, the source of the Lesedi and 813-carat “Constellation” is relatively new having commenced production in the summer of 2012. 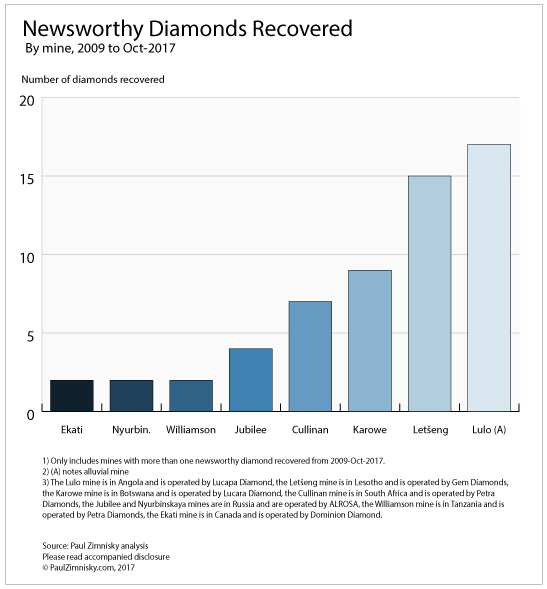 The company has continually worked to enhance the successful recovery of large-diamonds. Just this summer the mine’s processing plant was fitted with industry-leading technology aimed at identifying and recovering mega-stones without breakage. However, current large-diamond recovery technology still has its limits. Breakage during processing has been an ongoing challenge for Gem Diamonds (LSE: GEMD), owner of the Letšeng mine in Lesotho, another primary source of the world’s large diamonds. During the company’s most recent analyst call in August, management gave average-price-per-carat guidance that included a breakage rate of 80%, saying that while ameliorating breakage has been a priority, the results have been disappointing due to the limitations of current technology. Lucapa commenced commercial production at its alluvial Lulo mine in January 2015. Last year, Lulo diamonds averaged $2,983 per carat, the highest average-price-per-carat figure in the world for a commercial operation, but the mine only produced 19,800 carats. 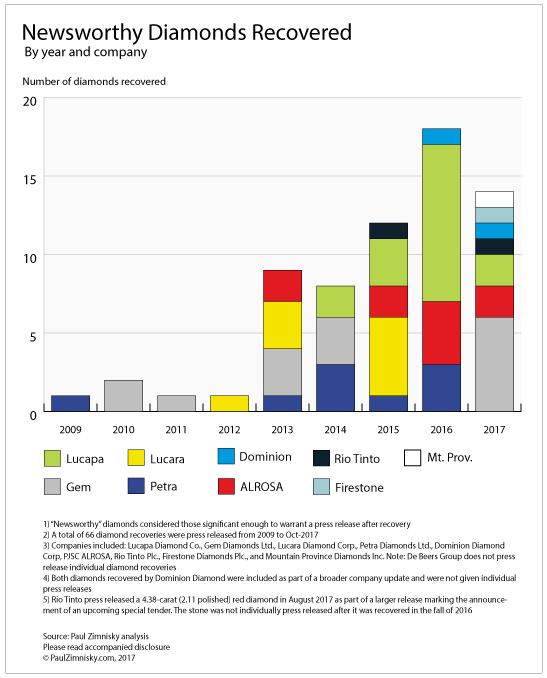 Over the last 3 years Lucapa press released 15 diamond recoveries, more than any other company, despite being one of the smallest publicly-traded diamond miners by market capitalization. Gem Diamond’s Letšeng mine produced 108,000 carats last year at an average-price-per-carat of $1,695, giving it the highest figure for a non-alluvial mine. The company has already produced 6 press-released diamonds in 2017 including 4 colorless diamonds in excess of 100 carats. 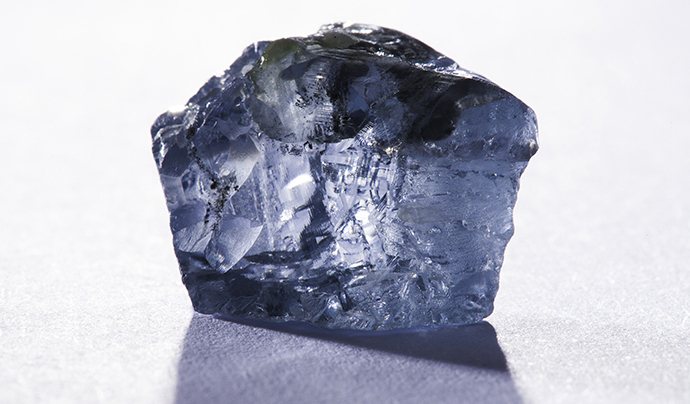 29.6-carat blue diamond recovered by Petra Diamonds in 2014. Source: Petra Diamonds. 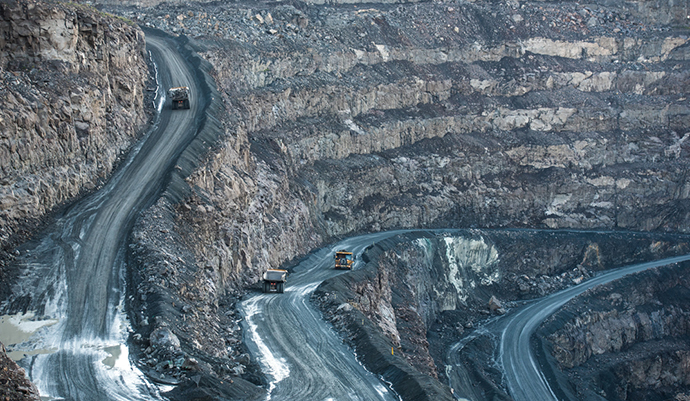 Lucara’s Karowe mine had an average-price-per-carat of $824 last year, producing 354,000 carats. Over the last year Lucara has been mostly processing Karowe tailings and has not produced any press-release-worthy diamonds, as torrential rain, a new contract miner, and increased waste-rock removal limited mining. However, with a processing plant upgrade now complete the company is well positioned to resume mining Karowe’s South Lobe, the portion of the ore body that produced the Lesedi and Constellation. Petra Diamond’s (LSE: PDL) Cullinan mine in South Africa is perhaps the prolific source of special diamonds in history. The mine has been in production since 1903 and is the source of the “Cullinan Diamond,” the largest rough diamond ever recovered at 3,106 carats, which resides in the British Crown Jewels. In January 2014, a 29.6 carat vivid blue diamond with “extraordinary saturation, tone and clarity” was recovered from the mine (see image above), and as recently as last year the mine produced 2 "newsworthy" white diamonds, both over 100 carats. It's important to note that while serving as a proxy for spectacular diamonds recoveries, press releases are not a conclusive database. Some companies are more aggressive than others with regards to publicizing specific recoveries and some producers do not announce individual recoveries at all. The second-largest diversified miner in the world, Rio Tinto (LSE: RIO), has only press released one rough diamond recovery in recent years despite being the sole-owner of the Argyle mine, the world's primary source for ultra-valuable pink, purple and red diamonds. 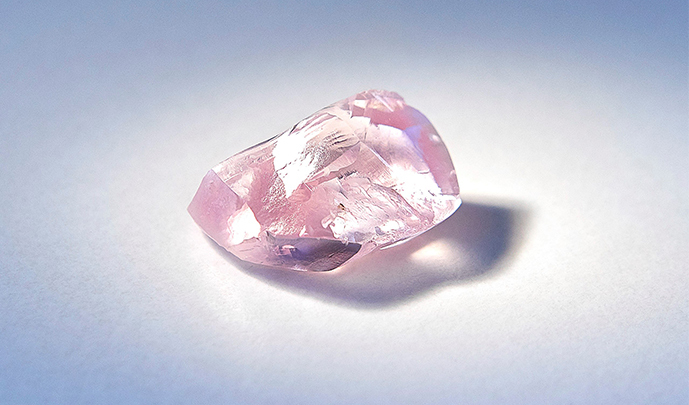 Instead Rio has press released the dates and offerings of its special Pink Diamond Tenders in two of the last three years, in essence debuting more than a year of production at once. In 2015 the special tender included 65 diamonds, this year the tender includes 58 diamonds, but the company has specifically highlighted a 2.11 (polished) fancy-red, the largest high-quality red diamond ever recovered. 104 carat D-color Type IIa diamond recovered by Lucapa in 2016. Source: Lucapa Diamonds. Russia’s ALROSA didn’t press release special diamond recoveries until they publicly offered a minority stake of the company in the fall of 2013, and subsequently increased financial reporting transparency. The largest diamond producer in the world by value, De Beers, does not announce the recovery of special diamonds, nor does its parent Anglo American (LSE: AAL). Privately held diamond mining companies and governments rarely publicize the recovery of individual diamonds. More detailed data on all 66 press-released diamonds over the last 9 years can be found here. Paul Zimnisky is an independent diamond industry analyst, consultant, and publisher of the State of The Diamond Market monthly industry newsletter. He can be reached at [email protected] and followed on Twitter @paulzimnisky.